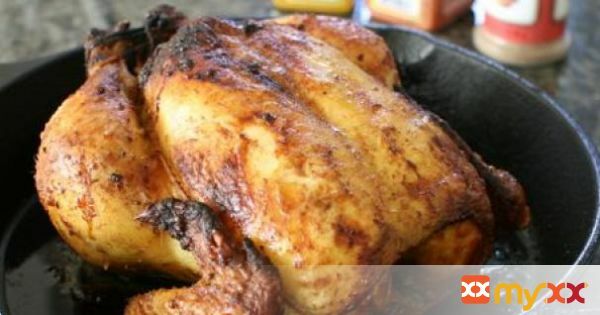 This is an easy marinade for Peruvian Roast Chicken that can be used either on a whole chicken or even chicken thighs! 1. Mix together the marinade ingredients. 2. Place the whole chicken into a large (about 2 gallon size) ziploc bag and pour in the marinade. 3. Spread the marinade so that it covers all the chicken. 5. Take the chicken out of the fridge about 30-45 minutes before you roast it, so it comes closer to room temperature. This helps the chicken become more moist and cooked evenly. 7. Remove the chicken from the marinate and brush off any garlic so it will not burn. 8. Lay the chicken breast side up in a roasting pan or cast iron skillet. 9. Truss the chicken. This keeps the juices in during the roasting and makes the meat more tender. 11. 1et rest 5 minutes before carving.